Can you tell us a little bit about your early life? Where did you grow up and what made you decide to get into surfing? I grew up near Manchester, worlds away from surfing and the sea. I grew up horse riding as it is my mum’s passion and always competed in shows when I had the chance. I have 4 sisters and a brother as well as lots of cousins. It was my cousin Tina who introduced me to surfing as she went to a surf club in her university. She took me to the cold brown waters of Scarborough for my first surf. It was pretty horrible conditions and pretty cold, but I loved it straight away. I remember being completely awful at it though and thinking that I would never be able to ride like my more experienced friends. But I have kind of become addicted to it and time in the water along with determination have helped me get better. I have to train a lot to keep up with the girls who have been surfing since they were kids. 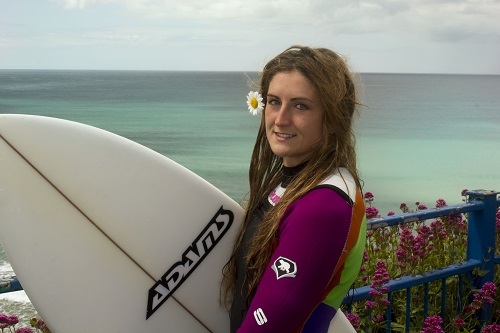 What is it like surfing in Cornwall? Do you have any favourite spots? Cornwall is such a beautiful place to be in the sea and on the land. Surfing with the backdrop of jaw dropping cliff tops and sparkling blue water. It is a top holiday destination so in the summer it can get pretty crowded at the most popular beaches and also the high pressures cause us to be cursed with small waves when the sun is out. I surf most the time at Fistral as this has peaks along the whole beach that can be all working differently and offer a variety of waves. It also picks up swell pretty well and all my friends surf there too so it can be pretty sociable (albeit a bit competitive). 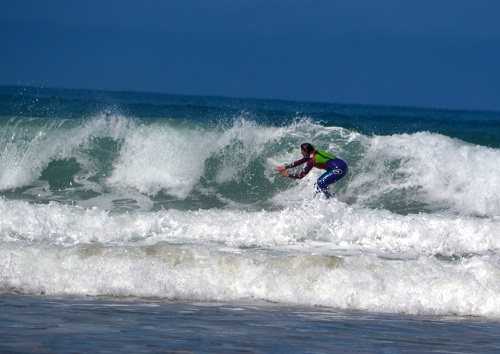 Do you predominantly surf during the summer months, or do you head out during the winter as well? I surf through it all. The winter is definitely tougher and I have to make myself get in the sea when it is awful. The summer is so nice though, thinner wetsuits and warm sea. Just the waves can be a bit small so the autumn is the best time. Can you describe an average day in your life? I do some cleaning at The Stable restaurant at Fistral Beach, they are a sponsor of mine as well as my employer. I normally do about 2 hours and I’m done by 8:30am. I can see the waves from here so I normally get in for a surf after that then have some food. I relax a bit and do any online work I need to do such as website and social media updates, interviews and any organising I need to do for contests and events. I surf again if the tides are right and then I can do other exercise like boxing, strength training, or swimming. What is your favourite surf board and why? I have two favourites the Adams 6’0″ P13 which is the standard team board as it is a good high performance board & the Adams 5’8″ Tonka as it holds a decent amount of volume and suits the summer waves. Being number 10 in the UK must mean that you are used to competitions. Do you enjoy them, and do you have any tips on competitive surfing that our readers would find useful? I love competing, it can be stressful too though so if I didn’t love it then I think I would have to stick to freesurfing. I like the buzz that is always going on around a contest and the anticipation of the conditions and who I will be competing against. I get less nervous now than I did in my first year but I still get butterflies in my stomach. I think you should embrace the nerves, an adrenalin rush is good as it keeps you alert. Don’t take it too seriously or you can get hung up on the result. Of course try to win, but accept the level you are at and be realistic with your goals. I try to beat my own scores first before worrying about the other girls. Do you take part in any other sports to keep your fitness level up? I do a lot of boxing. I am training hard and also plan to start fighting this upcoming winter. There are a lot of explosive exercises that are relevant to surfing. Do you have to restrict your diet at all? I try to not eat too many carbs and no white bread or pasta. I eat a lot of fresh fruit and veg and swear by bananas. I don’t drink alcohol either and drink lots of water. This year I am concentrating on increasing my wave scores in competition as I want to beat my previous year. I need to attract another sponsor willing to give me a decent budget for film making and travel so I can make good quality movies as I am pretty passionate about this and love to be creative. I have an ongoing series out called Heaven is an A Frame which you can find on YouTube so I will add to this too. You can follow Jessie on Facebook and visit her website to keep up to date with her career. We wish her the best of luck for the future. 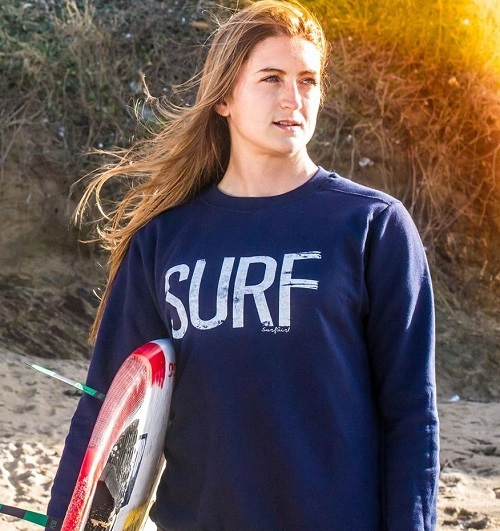 This entry was posted in Featured, Surfing, Water Sports and tagged Surfer, Surfing, UK. Bookmark the permalink.